Graham Innovations designs new electronics for veterinary applications. This article is sponsored content brought to you by BCF Ultrasound. Melbourne-based Research & Development company, Graham Innovations, is using the latest technologies to create practical solutions for veterinary and agricultural industries. You may already be aware of their flagship product, the NFI5000 monocular—most commonly used by cattle veterinarians as a head-mounted viewing device for portable ultrasonography. Although founded over 8 years ago, it wasn’t until 2017 when director Chris Graham decided to expedite his dream of designing new technologies and electronics for veterinary applications. As Chris says, he could have “bought a motorbike or became the next Australian Ninja warrior”. Instead, he worked on realising his dream of developing a company that could lead the industry to new levels of efficiency, making the production of new, innovative devices a reality. All of this was sparked by his years of doing in-field ultrasound demonstrations with vets, and realising that there were a plethora of problems that needed solving. In addition to Chris’ 38 years’ experience in electronics, he has attracted a world-class team of engineers to Graham Innovations, led by head engineer, Dr Jack Li. 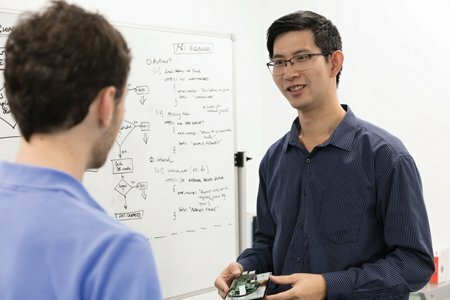 The team brings together a unique mix of expertise in all the latest technologies, aligning with the Industry 4.0 manufacturing concept, such as the Internet of Things (IoT), Big Data, cloud computing, mobile technology, microelectronics, and low power sensors. Artificial Intelligence (AI) is one area of particular interest. As Dr Jack Li says, it is not “only the plaything of big tech companies”, although other industries have struggled to capitalise on the advances in this area. Graham innovations are currently working on the algorithm model construction and sample training for AI applications in medicine and agricultural industries. Dr Li hopes that this technology could “bring a huge boost to economic productivity” in the near future. The goal for Graham Innovations is to bring practical and high-quality products to market. Its latest product is a tiny active splitter and low latency wireless video transceiver that can be used in many applications, including in combination with the NFI5000 monocular. You can now run multiple viewing devices to train young vets or show owners. Coming soon is an IoT (Internet of Things)-based platform called GiSmart for veterinary medicine and agriculture applications. This platform improves productivity, data collection and convenience to clients, so stay tuned for more information when this exciting product is released. So where does the future lie for Graham Innovations? Here is the final word from Director Chris Graham: “We already have three projects underway, and now with AI knocking on our door, they are progressing nicely into this area—it is all very exciting.